Peloton is a game completely free of charge. 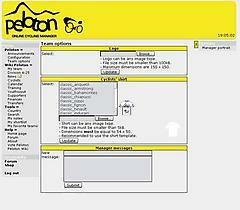 Peloton Premium offers several features to increase the fun and atmosphere of the game. Although Peloton Premium does not offer any direct advantages in the game, Premium users will have more fun features and possibilities at their disposal to get the maximum out of the game! Furthermore, Premium users also support the game and allow the further development and enhancement of Peloton! Peloton Premium offers several features to increase the fun and atmosphere of the game. 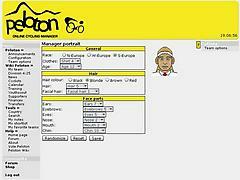 Team extras: you can upload your personal logo for your team and change the shirts of your cyclist. Press: issue a press release to tell the world about your achievements. Notes: save your plans for the future here. Fanclub: you can join other Premium players' fanclubs and they can join yours. Shortlist: save the cyclists you would like to see in your team. Cyclist biographies: each of your cyclists can have a biography which everyone can read. Guestbook: other managers can leave a message for you. No advertisements: Premium members will not see any advertisements on the top of the screen. Peloton is always being developed further, also the list of Premium features.